From the spectacular US National Parks and New England's brilliant fall foliage to the craggy shores in Eastern Canada and the dazzling mountain lakes in the Canadian Rockies, Globus offers several remarkable tours throughout the United States and Canada. 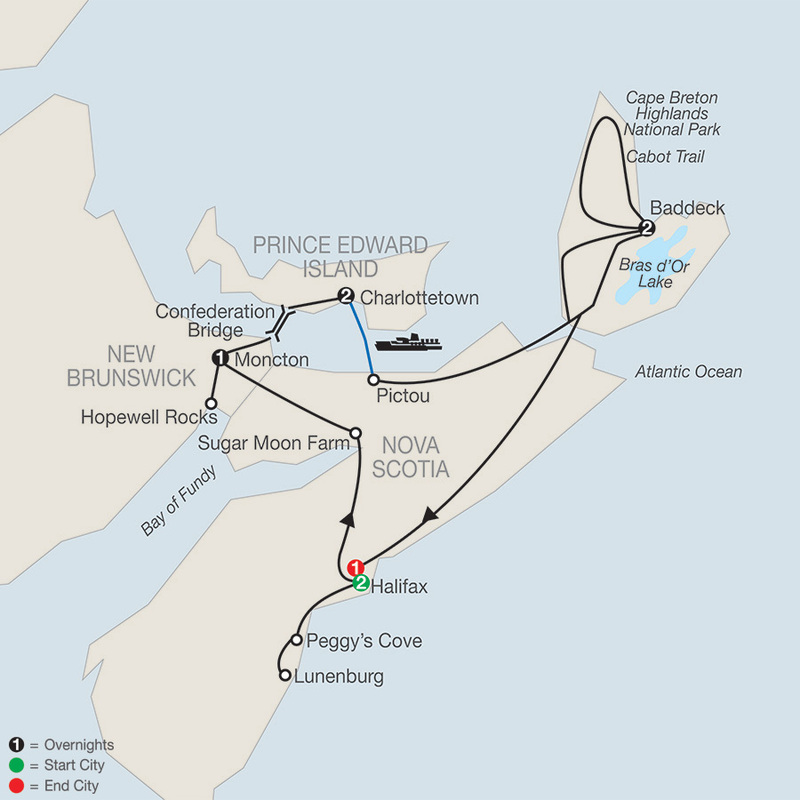 Discover the heart of Canada’s Atlantic seacoast on this wonderful vacation. This tour begins and ends in Halifax with overnights also in Moncton, Charlottetown, and Baddeck. Along the way, you’ll experience scenic drives, visit beautiful national parks and quaint fishing ...Read More. 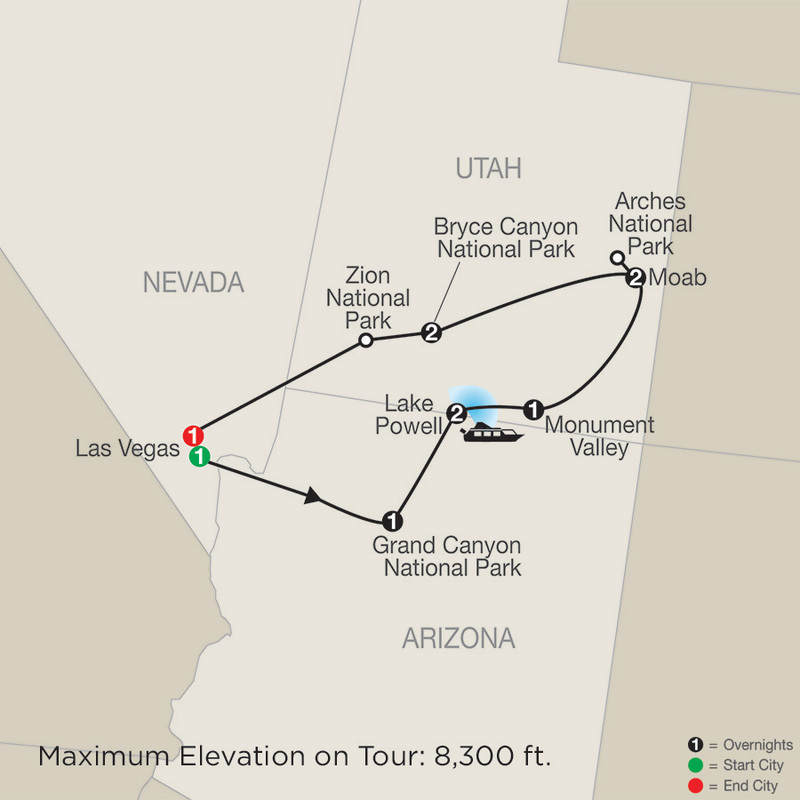 On this popular National Parks tour, discover the unique landscapes of Arizona and Utah as you travel through four national parks—as well as Lake Powell and Monument Valley—and lots of beautiful scenery. 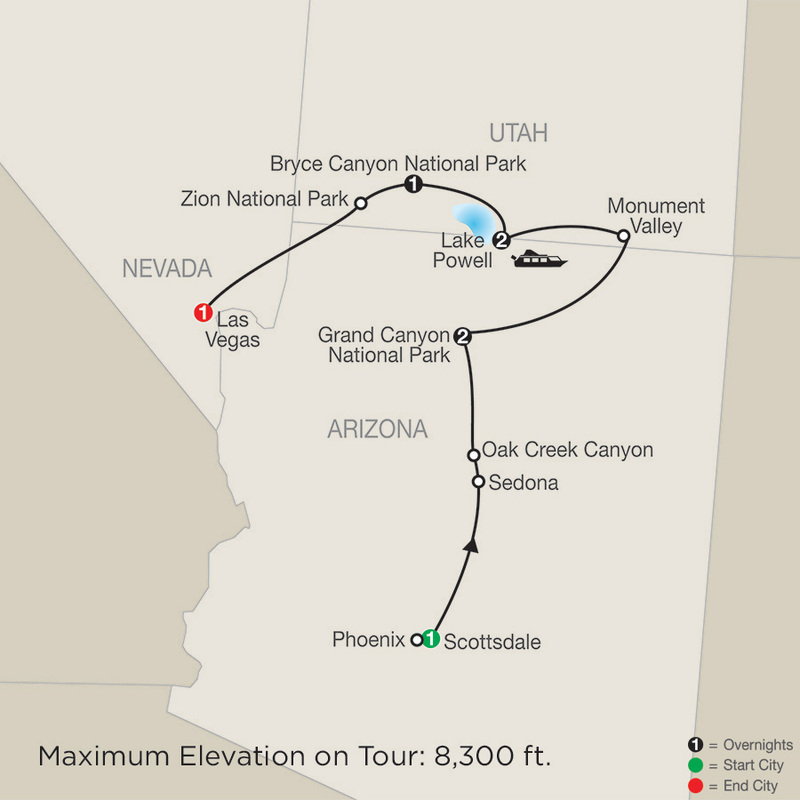 Your tour begins in Scottsdale and ends in Las Vegas with overnights also ...Read More. Vibrant cities, stunning scenery, and out-of-the-ordinary experiences await you on this Historic Cities of Eastern Canada tour. 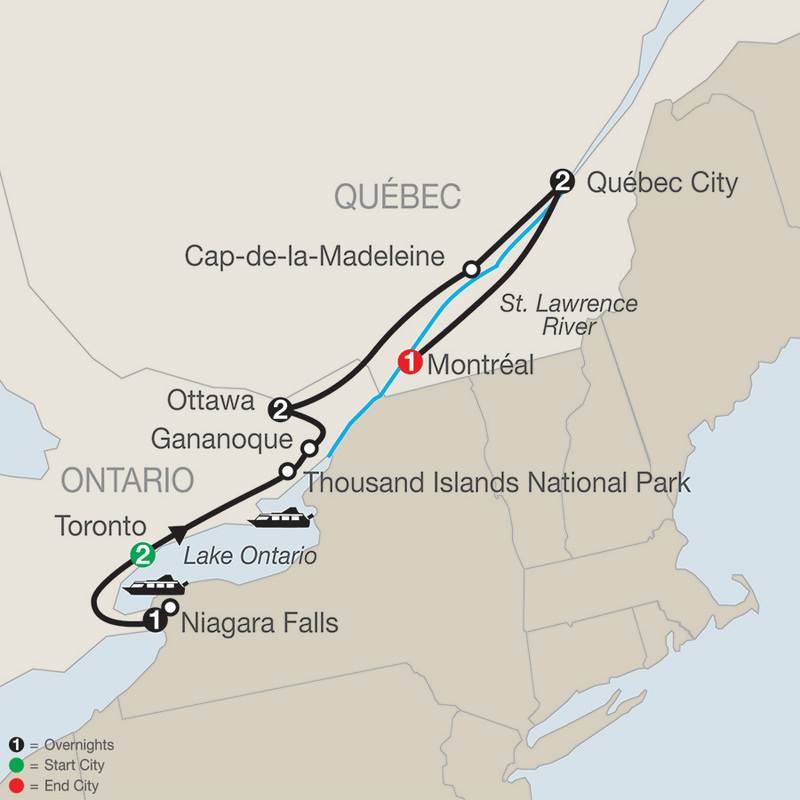 You'll start in Toronto and end in Montréal with overnights also in Niagara Falls, Ottawa, and Québec City. 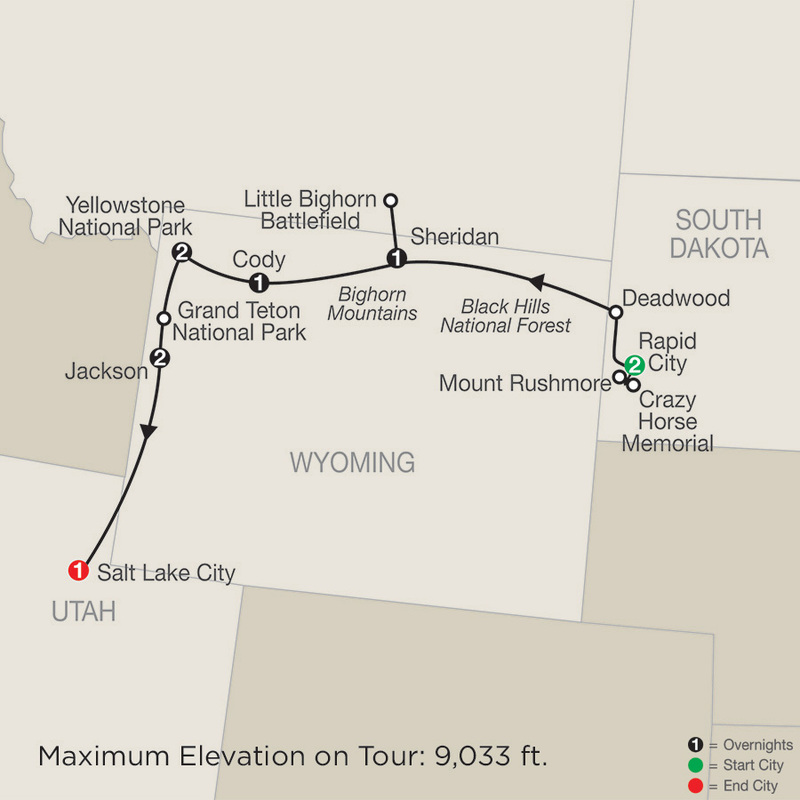 On your sightseeing tour in each city, ...Read More. This Canadian Rockies & Glacier National Park tour delivers the pristine wilderness of several national parks and the soaring beauty of the Rockies on both sides of the Canada/U.S. border. 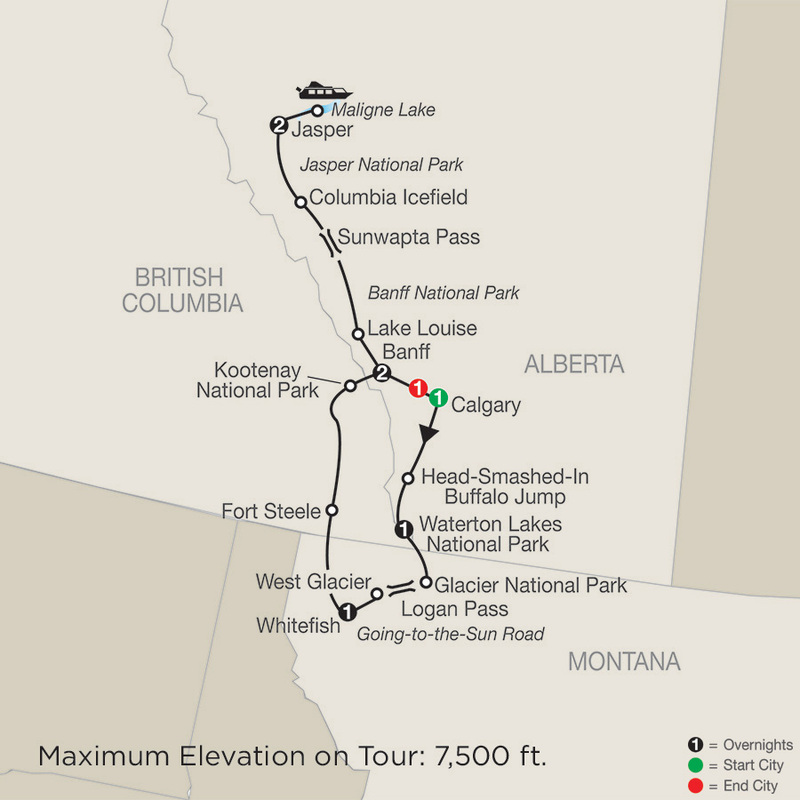 In Canada, travel to Waterton Lakes National Park, an UNESCO World Heritage Site with ...Read More. 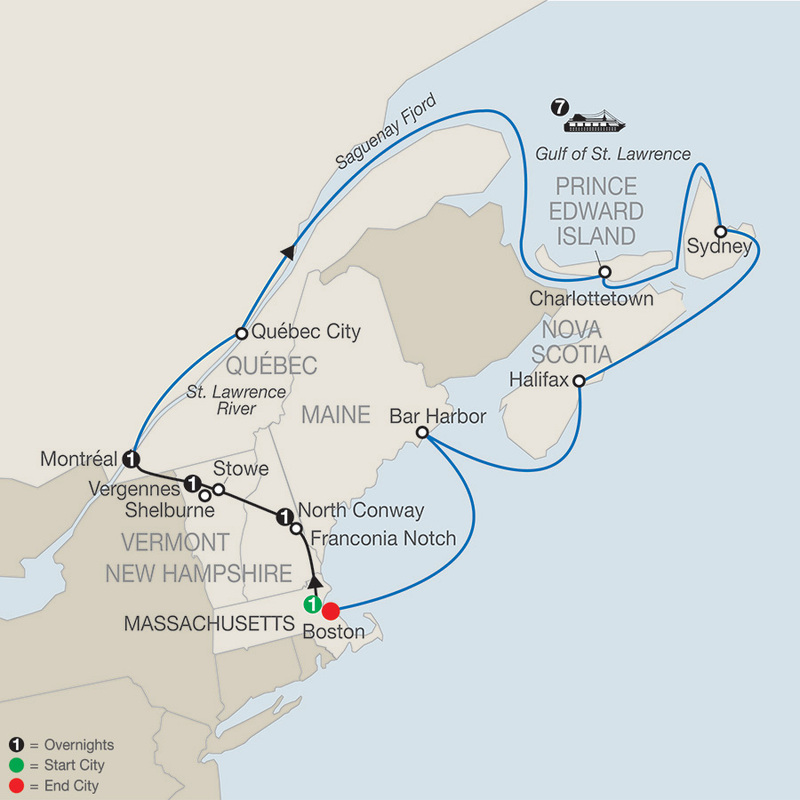 Savor the diversity and history of the great cities of New England and Eastern Canada on this enchanting vacation. 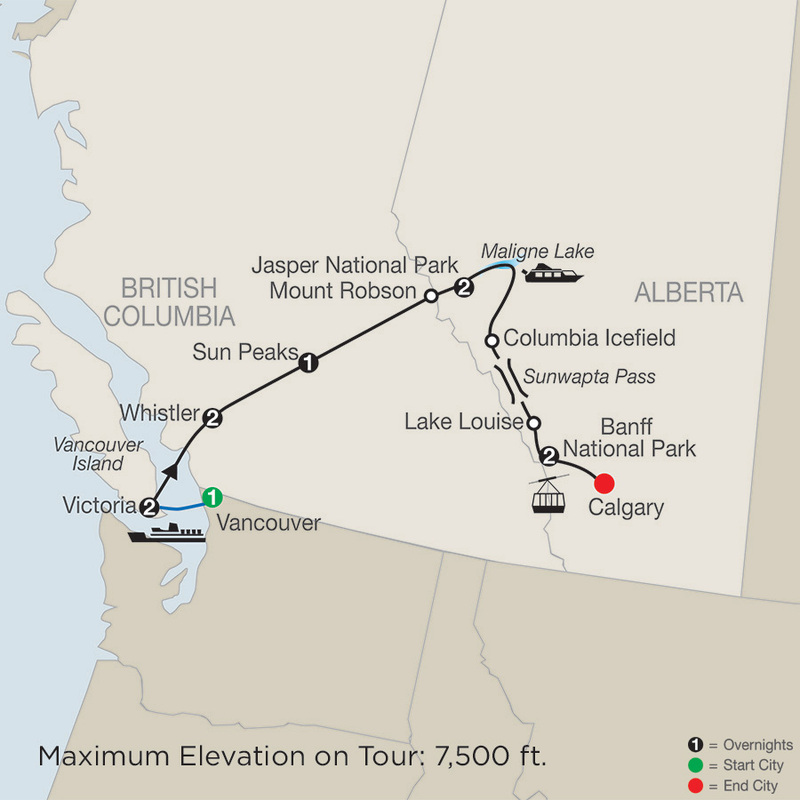 The highlight of this tour is a 7-night cruise to Canada’s historic towns and beautiful places. 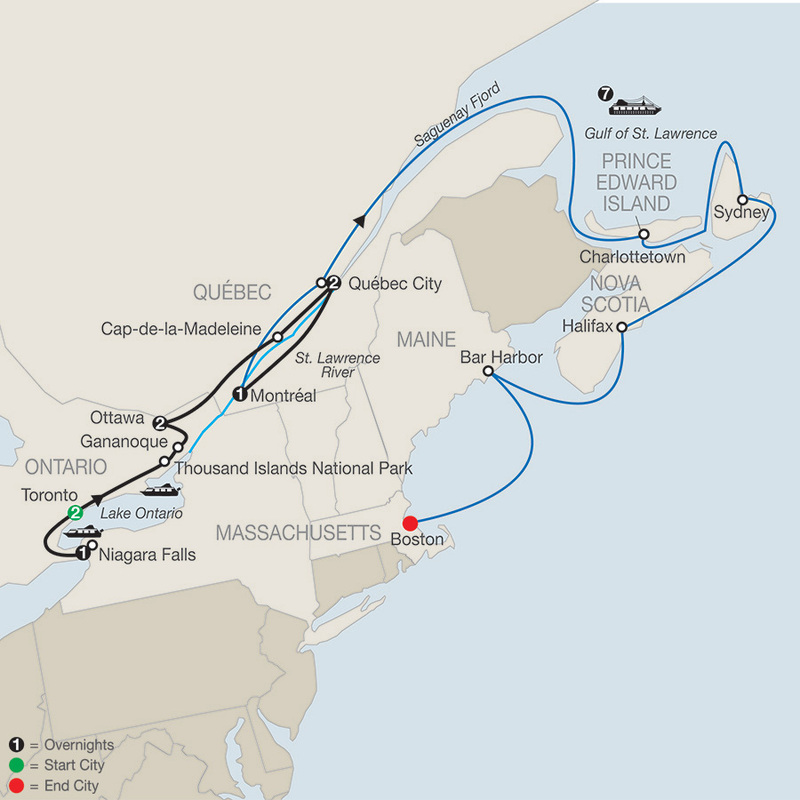 Aboard a 5-star Holland America ship, travel to Québec City, a ...Read More. New England is steeped in history and known for its amazing fall foliage, and on this fall foliage tour you’ll have a chance to experience the spectacular beauty and historic places. A sightseeing tour in Boston highlights landmarks that were pivotal to the United States’ ...Read More. 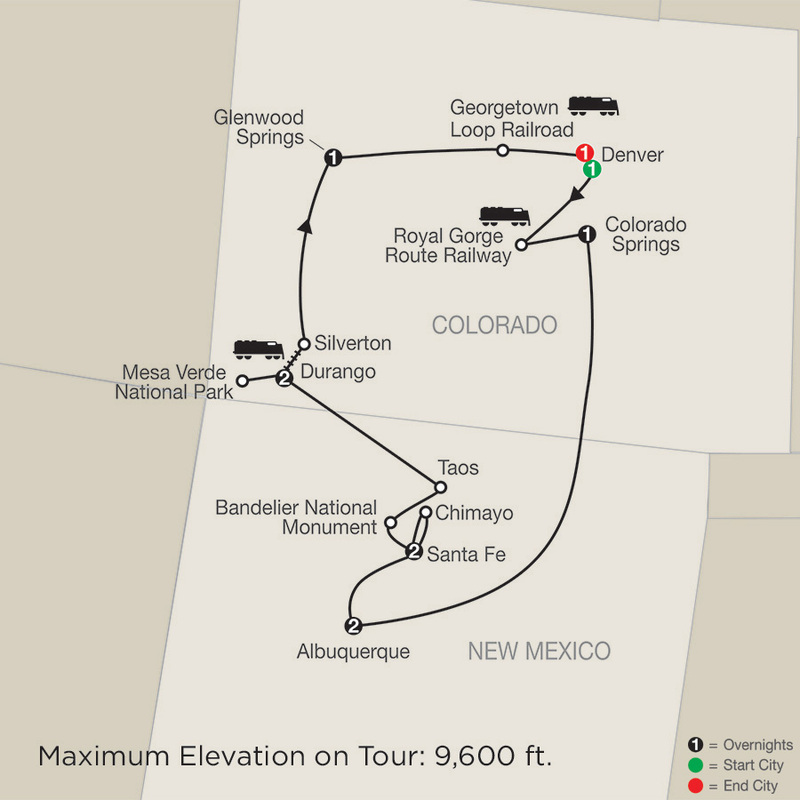 Take a ride back in time on an escorted vacation in Colorado and New Mexico. Begin with sightseeing in the “Mile High City” of Denver, including the historic Union Station in stylish lower downtown (LoDo). Then travel south and be awed by the natural surroundings of the Royal ...Read More. Experience the wonders of the West through its best-known national parks and gold-mining towns on this colorful vacation. If you’re interested in seeing stunning scenery and amazing wildlife, this National Parks tour is for you. Stay two nights inside Yellowstone National Park, ...Read More. Experience the wonders of the West through its best-known national parks and gold-mining towns on this colorful vacation. 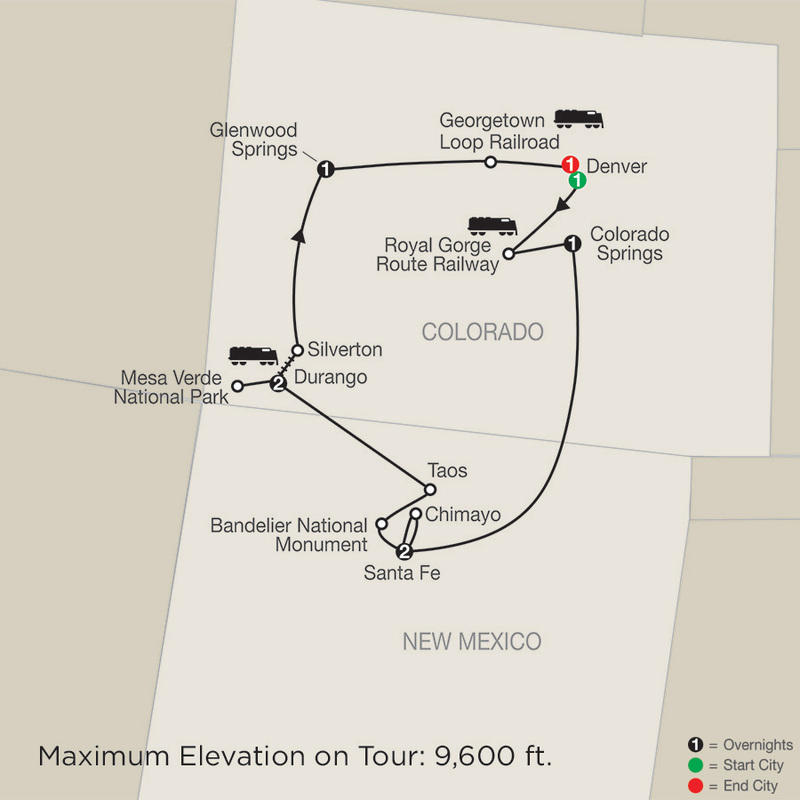 If you’re interested in seeing stunning scenery and amazing wildlife, this National Parks tour is for you. Spend two nights inside Yellowstone National Park, ...Read More. The Canadian Rockies—a land of majestic mountain scenery, fascinating wildlife, sparkling glaciers, crystal-clear lakes, and interesting towns. If you want to see breathtaking scenery and jagged mountain peaks, this Canadian Rockies tour is for you. Spend time in Vancouver, ...Read More. 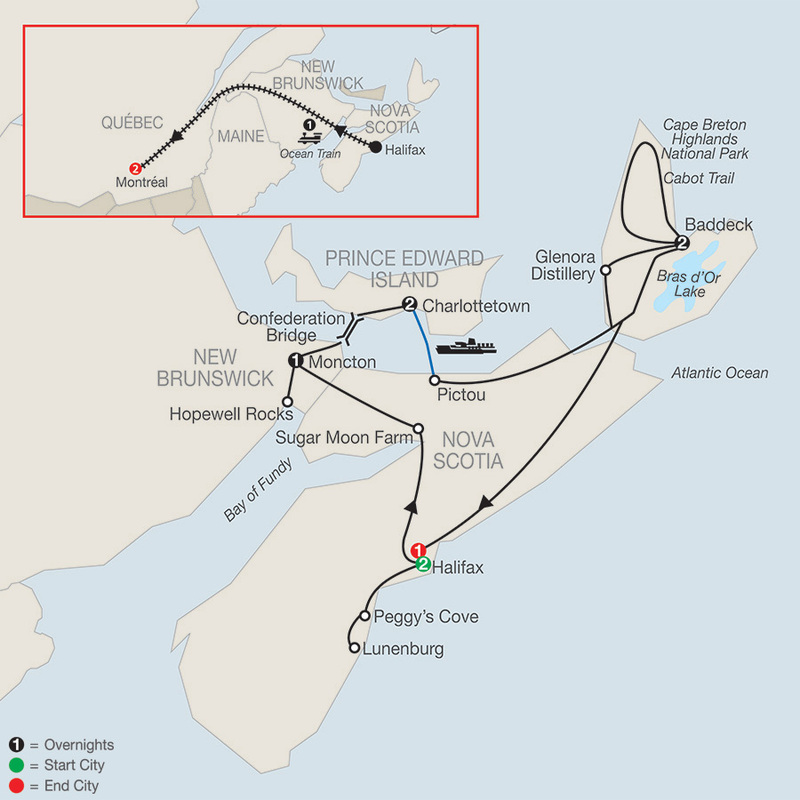 Discover the heart of Canada’s Atlantic seacoast on this wonderful vacation. This tour begins in Halifax and ends in Montréal with overnights also in Moncton, Charlottetown, and Baddeck. Along the way, you’ll experience scenic drives, visit beautiful national parks and quaint ...Read More. Vibrant cities, charming and historic small towns, stunning scenery, and special experiences await you on this Eastern Canada tour. 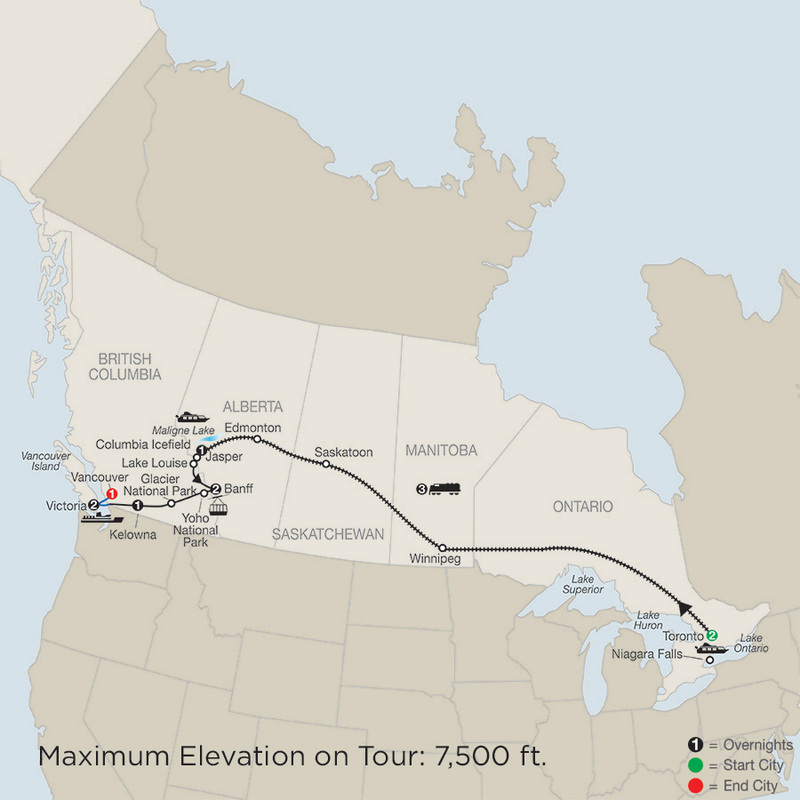 Your tour starts in Toronto and ends with a 7-night Canada cruise with overnights also in Niagara Falls, Ottawa, Québec City, and Montréal. On ...Read More. From San Francisco to Los Angeles, see the famous sights of California on this spectacular vacation. 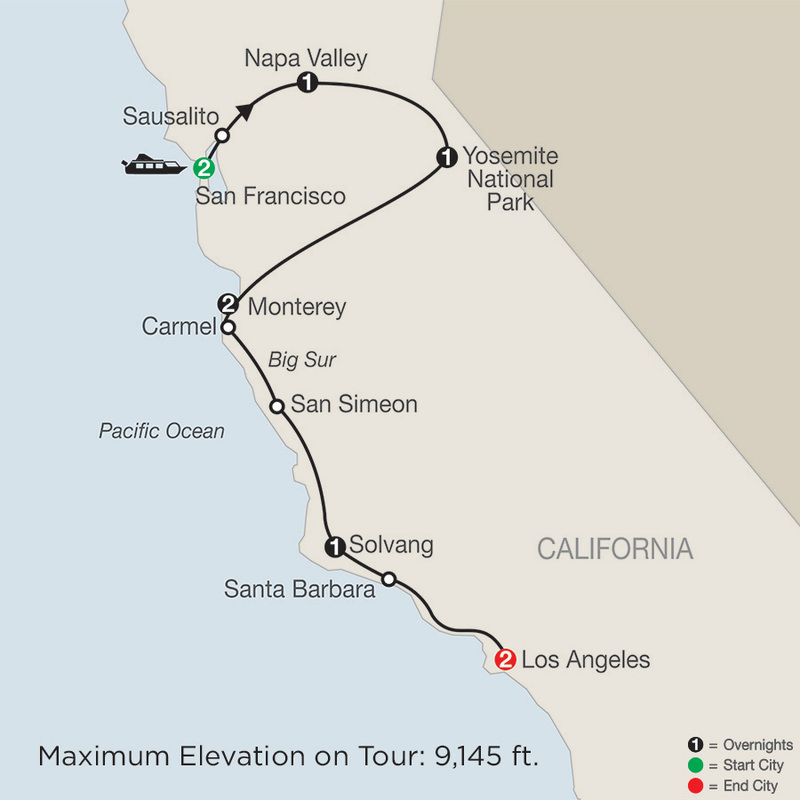 Enjoy the excitement and faster pace of San Francisco and Los Angeles, and take a deep breath and slowdown in the areas of Napa Valley and Yosemite National Park. If you’re ...Read More. Discover the captivating Canyonlands on this unforgettable National Parks tour! First, experience Grand Canyon National Park with its spellbinding landscapes that will excite your senses. 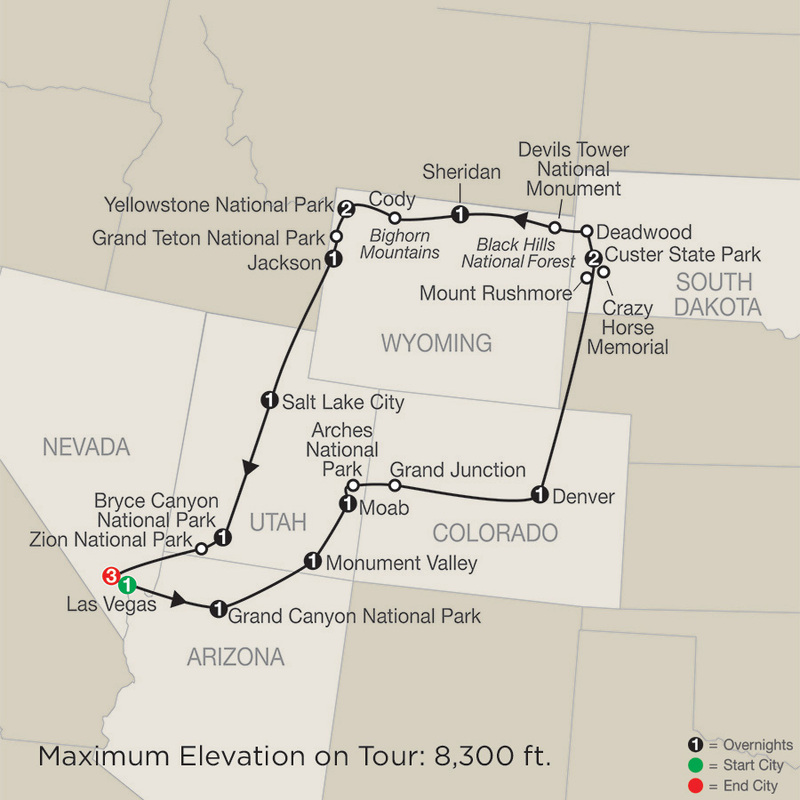 Your Grand Canyon hotel is located near the rim, giving you a wonderful opportunity to ...Read More. 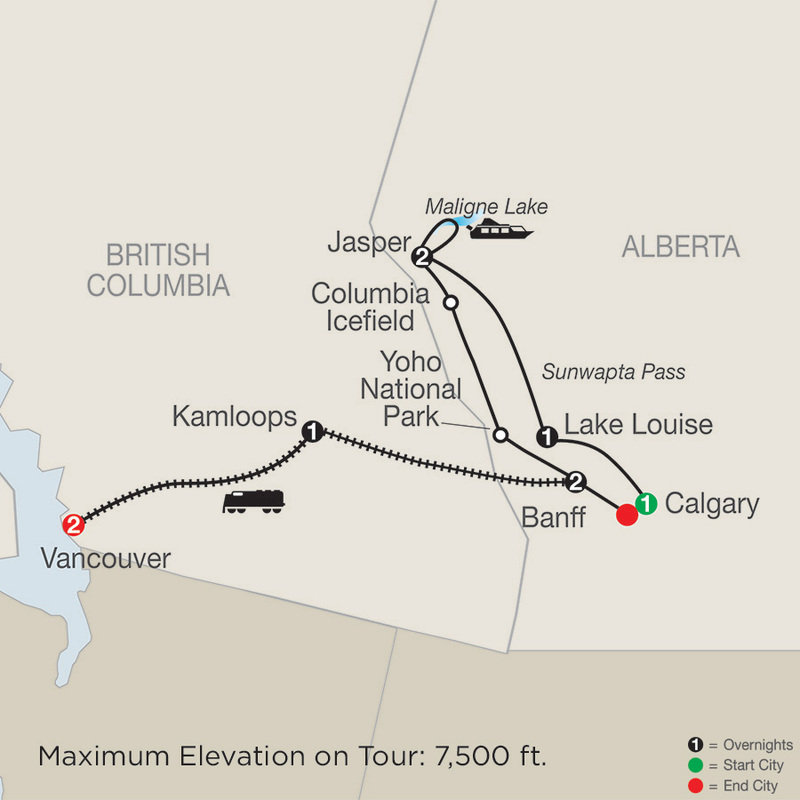 World-class Canadian resorts combined with breathtaking scenery highlight this Canadian Rockies tour. 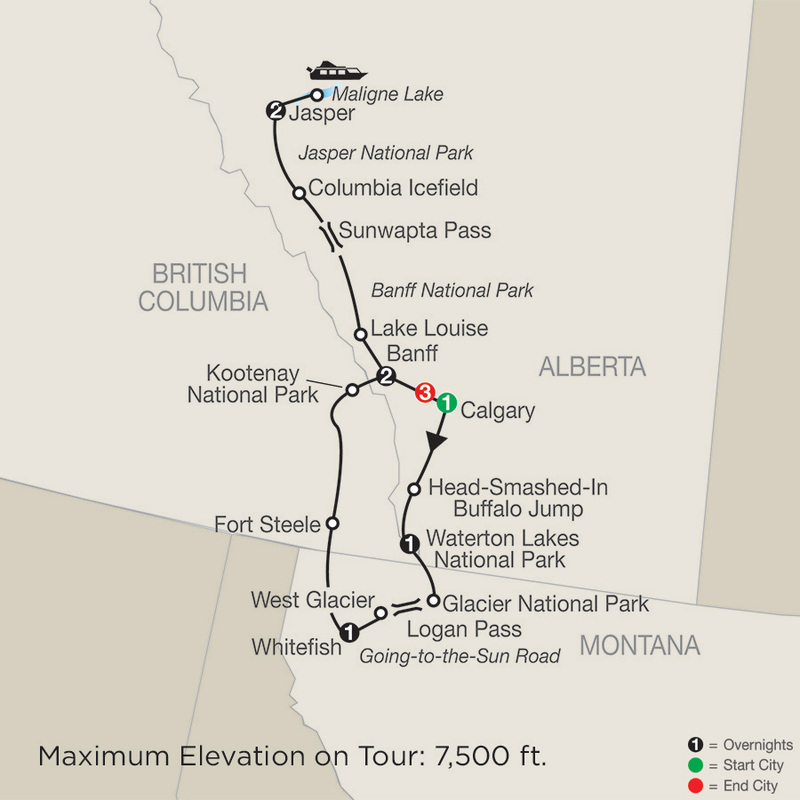 Start and end your vacation in Calgary with overnights also in Lake Louise, Jasper, and Banff. In Lake Louise, you’ll stay at the elegant Fairmont Chateau Lake Louise, known for ...Read More. 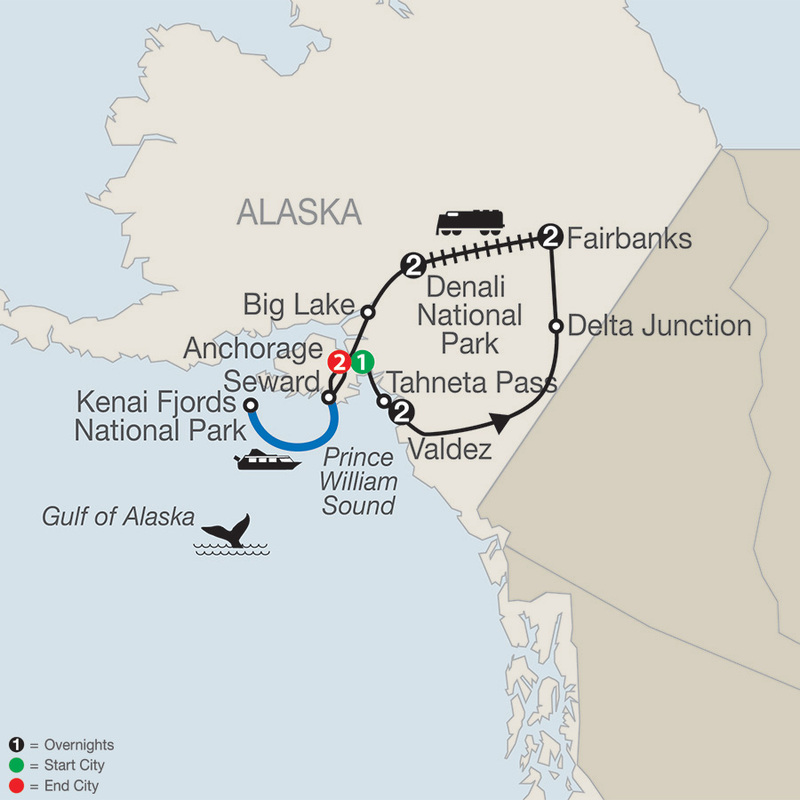 When you think of a spectacular Alaska vacation, what comes to mind? Witnessing glaciers calve into the sea? 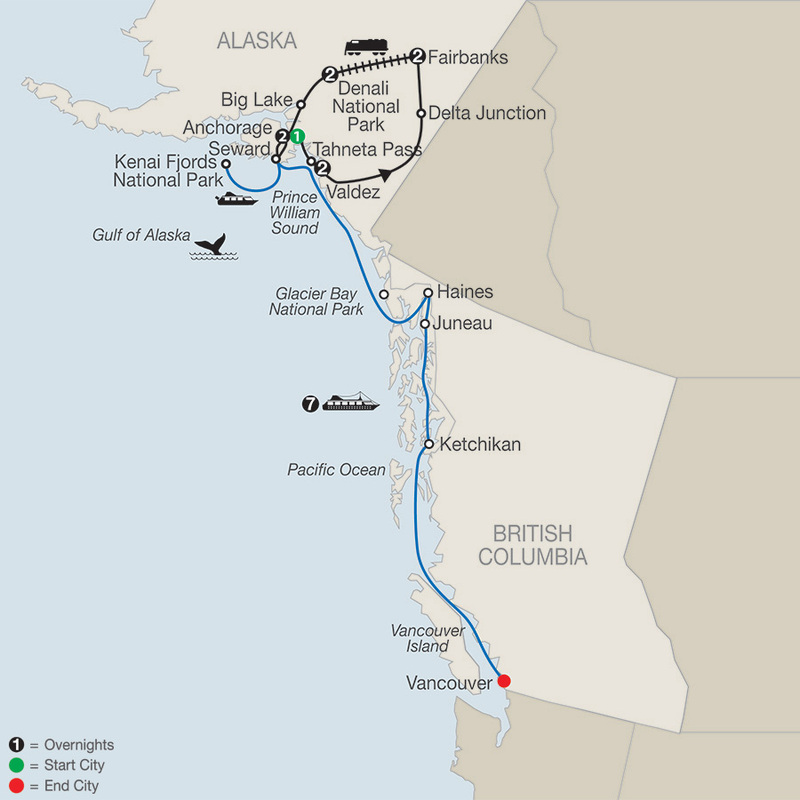 Riding the world-famous Alaska Railroad? Seeking out wildlife in Denali National Park? Or maybe it’s cruising through the sea to watch for seals, sea otters, birds, and ...Read More. 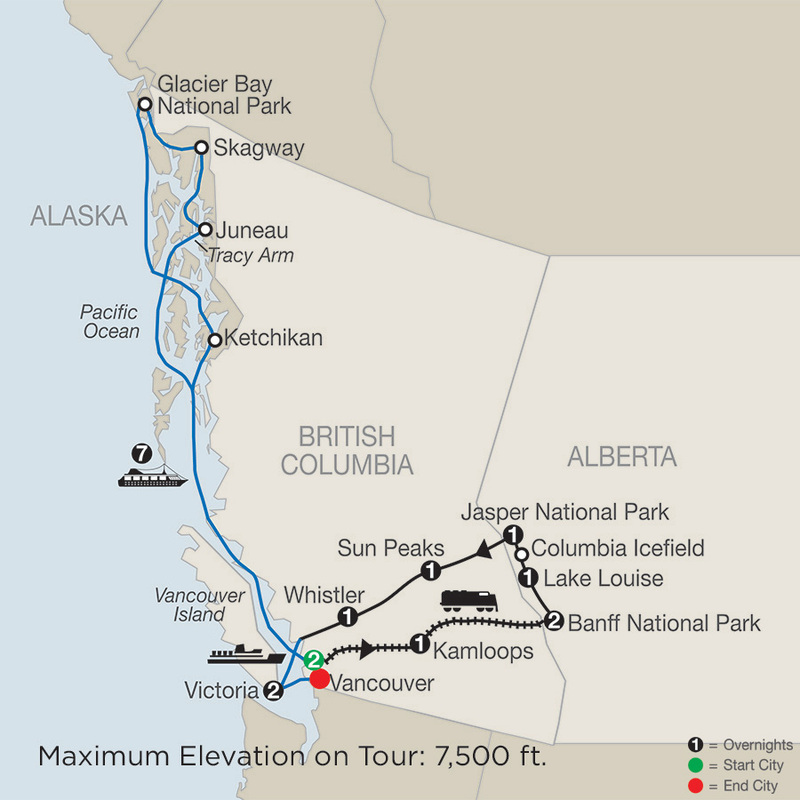 This Canadian Rockies & Glacier National Park tour delivers the pristine wilderness of several national parks and the soaring beauty of the Rockies on both sides of the Canada/U.S. border. 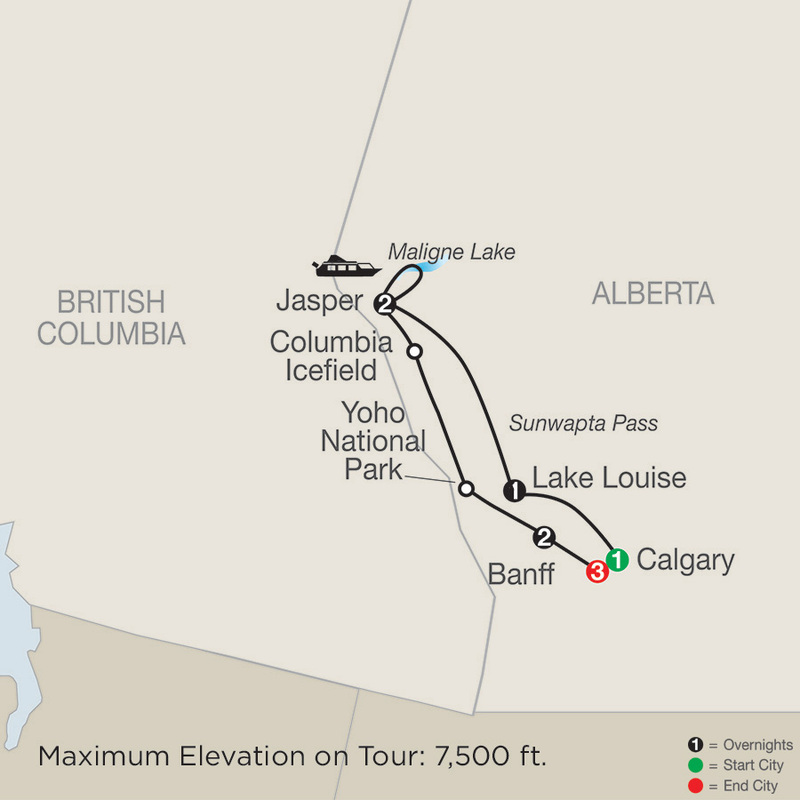 In Canada, overnight in Waterton Lakes National Park, with its rugged mountains and ...Read More. 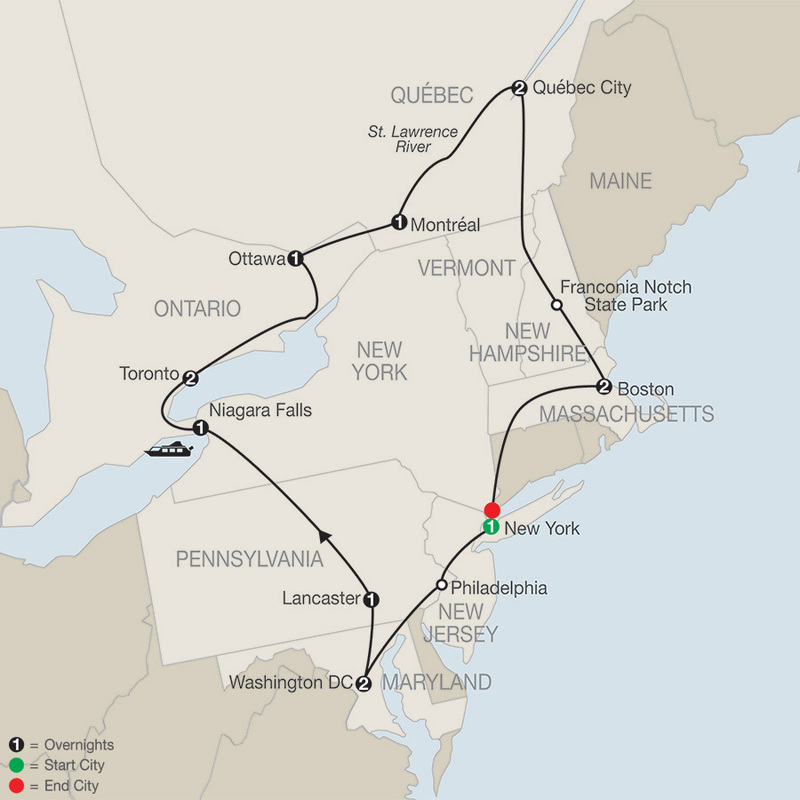 This guided tour of Northeastern United States and Canada begins in New York City—the “Big Apple”—with a sightseeing tour of New York City’s most iconic spots, including the Empire State Building, China Town, and Broadway. Travel to Philadelphia to see the Liberty Bell and ...Read More. 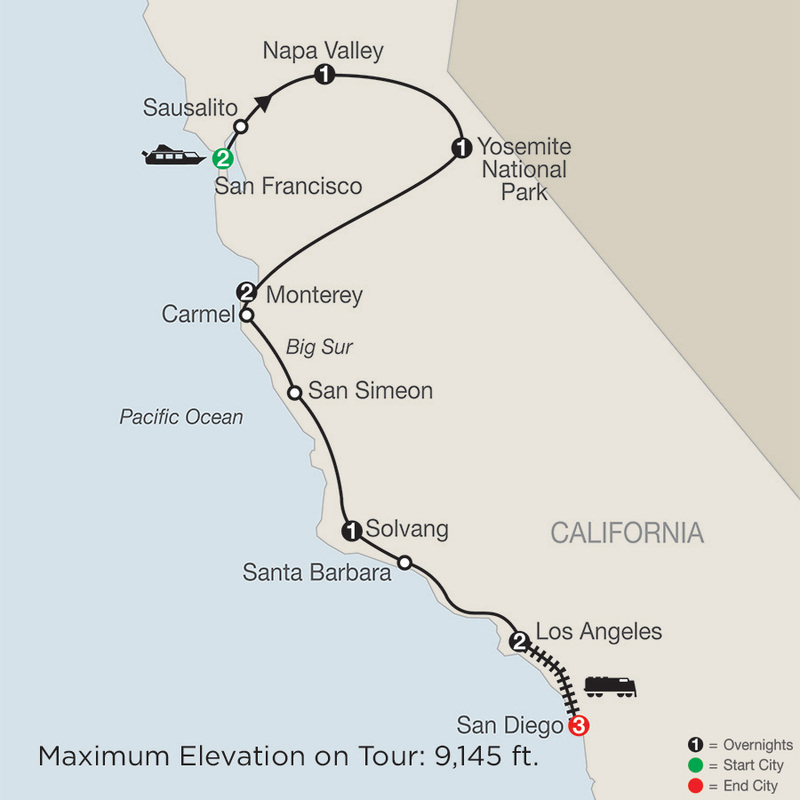 From San Francisco to San Diego, see the famous sights of California on this spectacular vacation. Enjoy the excitement and faster pace of California’s largest cities—San Francisco, Los Angeles, and San Diego—and take a deep breath and slowdown in the areas of Napa Valley and ...Read More. 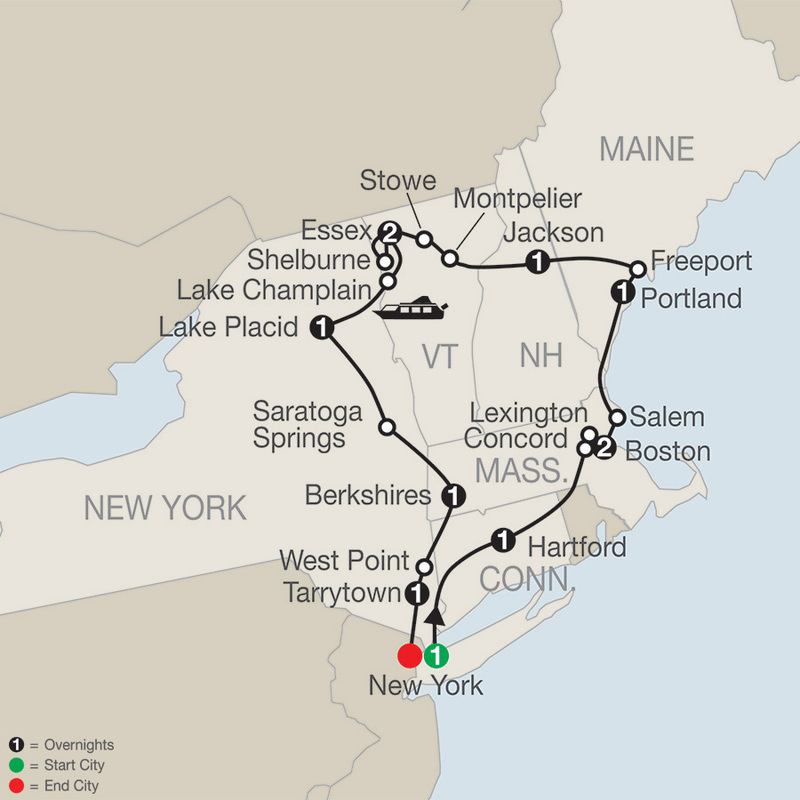 Explore the beauty of America’s historic East Coast on your guided tour of New England and New York’s Hudson Valley. Your trip begins in the “Big Apple” of New York City, where you’ll see iconic sights—from Broadway to the Empire State Building. 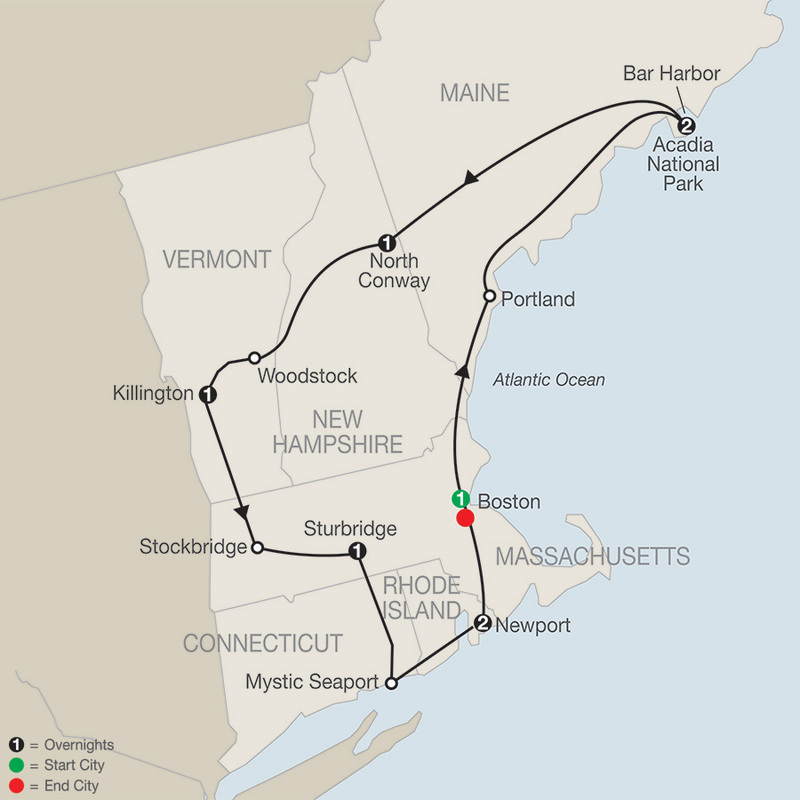 Visit the Hartford, Connecticut ...Read More. Marvel at the West's premier natural wonders on this multi-state vacation. 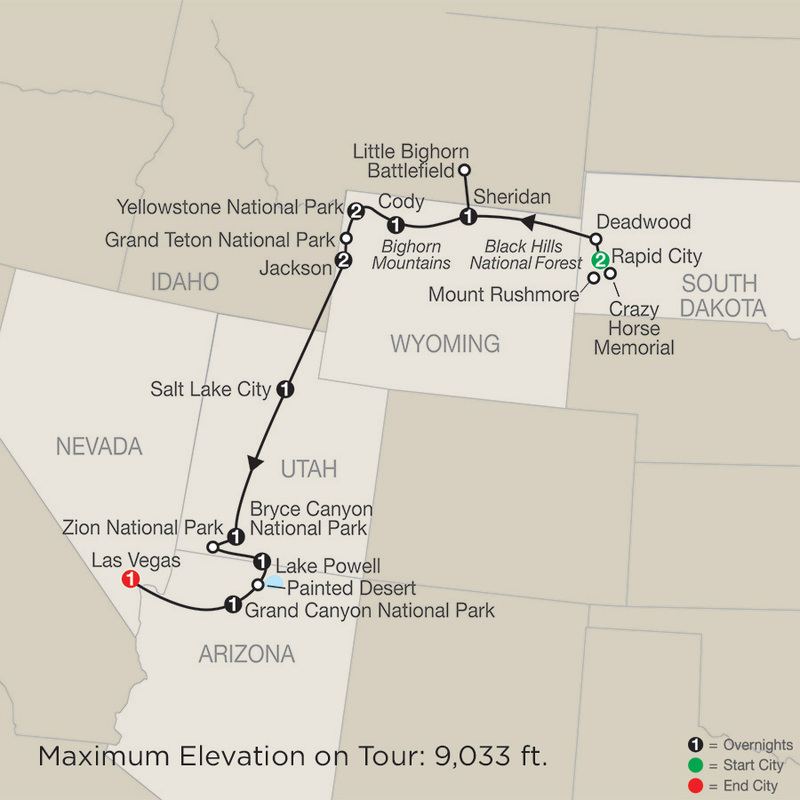 Your National Parks tour starts in Rapid City, South Dakota, and ends in Las Vegas with overnights along the way in Sheridan, Cody, Yellowstone National Park, Jackson, Salt Lake City, Bryce Canyon ...Read More. Marvel at the West's premier natural wonders on this multi-state vacation. 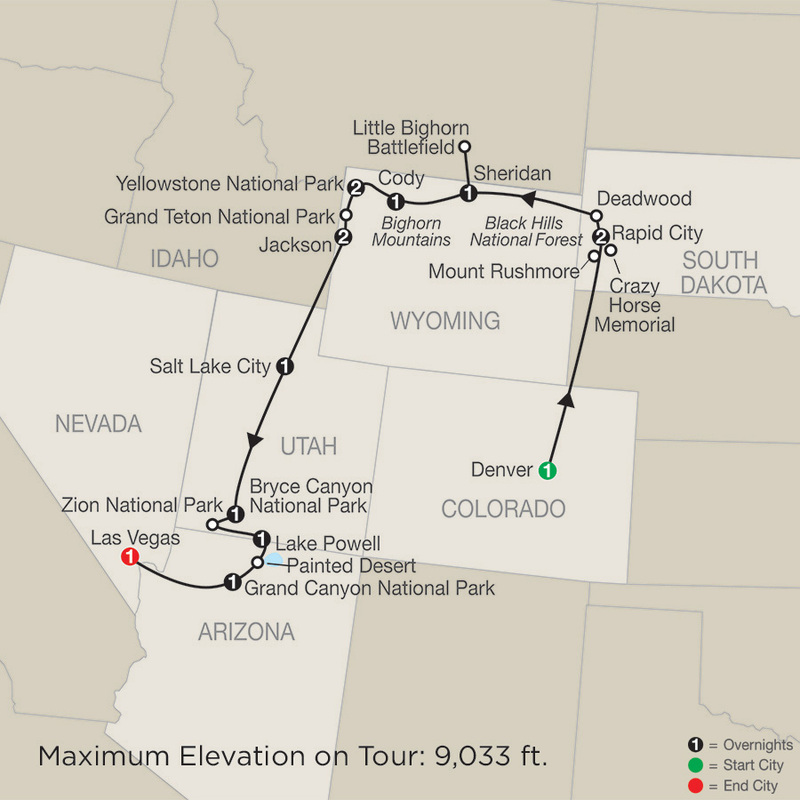 Your National Parks tour starts in Denver and ends in Las Vegas with overnights along the way in Rapid City, Sheridan, Cody, Yellowstone National Park, Jackson, Salt Lake City, Bryce Canyon National Park, ...Read More. 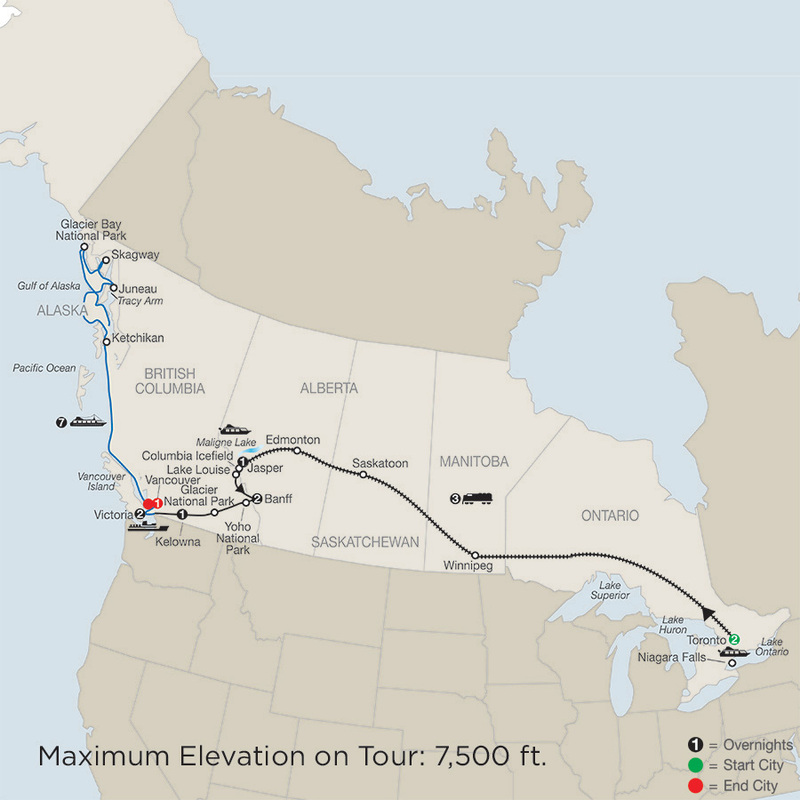 This breathtaking tour crosses Canada using the historic railroad. 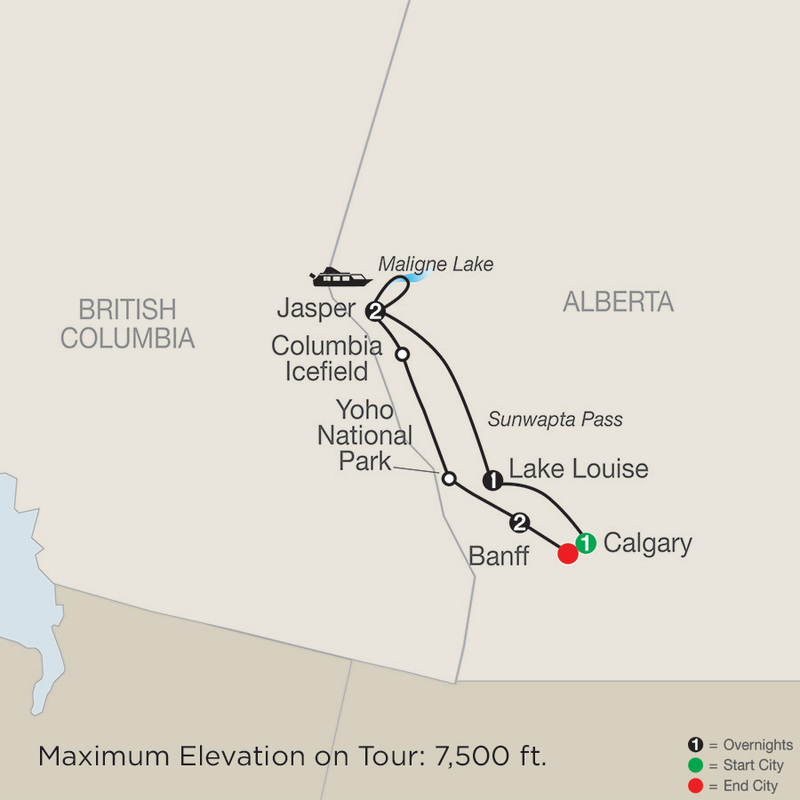 It features spectacular scenery, including an excursion to Niagara Falls, where you’ll enjoy a cruise to view the falls from the river level; an excursion from Jasper to Maligne Lake, the largest glacially formed ...Read More. Mother Nature has produced some remarkable scenery, and on this National Parks tour, you’ll have the opportunity to experience some of nature’s finest. 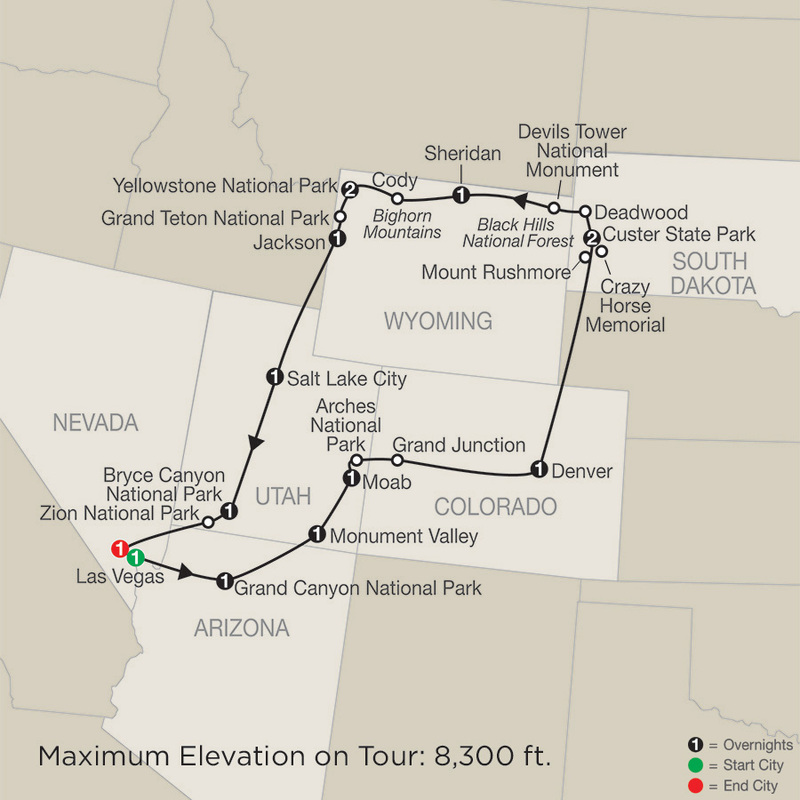 This tour focuses on the West’s great national and state parks, including Grand Canyon National Park, Arches National Park, ...Read More. Create a lifetime of incredible memories traveling through the unforgettable Canadian Rockies! 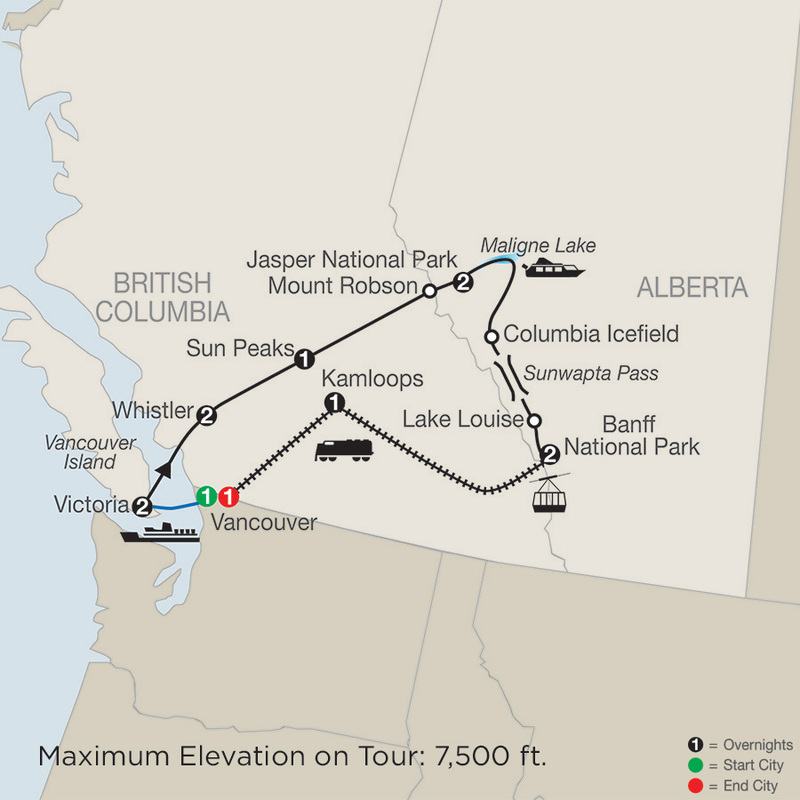 Begin your Canadian Rockies tour with sightseeing in Vancouver and end with a ferry ride through the Gulf Islands from Victoria to Vancouver. In between, witness breathtaking scenery ...Read More. Create a lifetime of incredible memories traveling through the unforgettable Canadian Rockies! 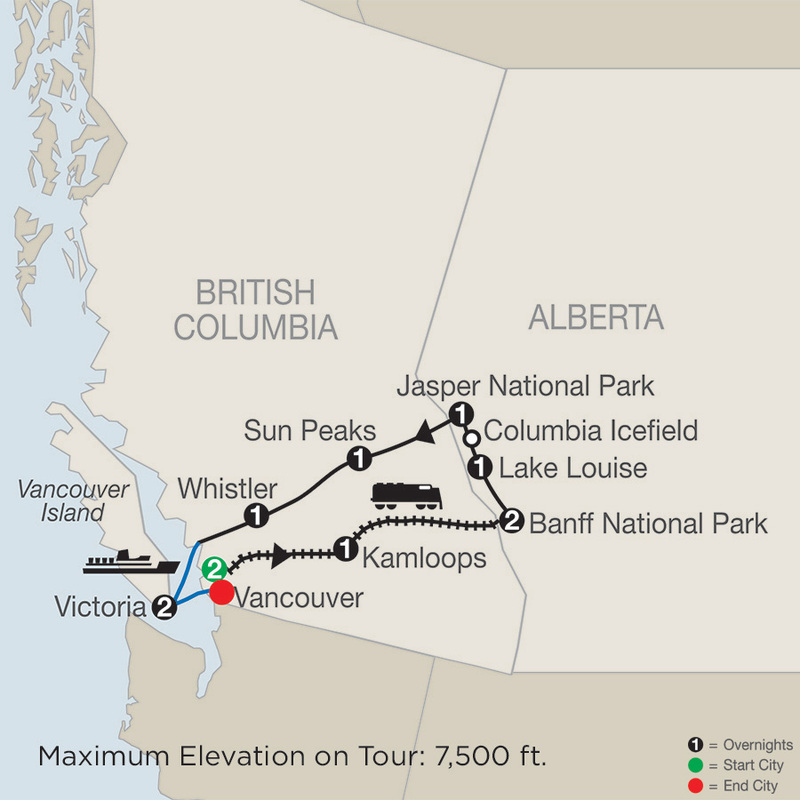 Begin your Canadian Rockies tour with sightseeing in Vancouver and end with a 7-night Alaska cruise. In between, witness breathtaking scenery and enjoy fun experiences. 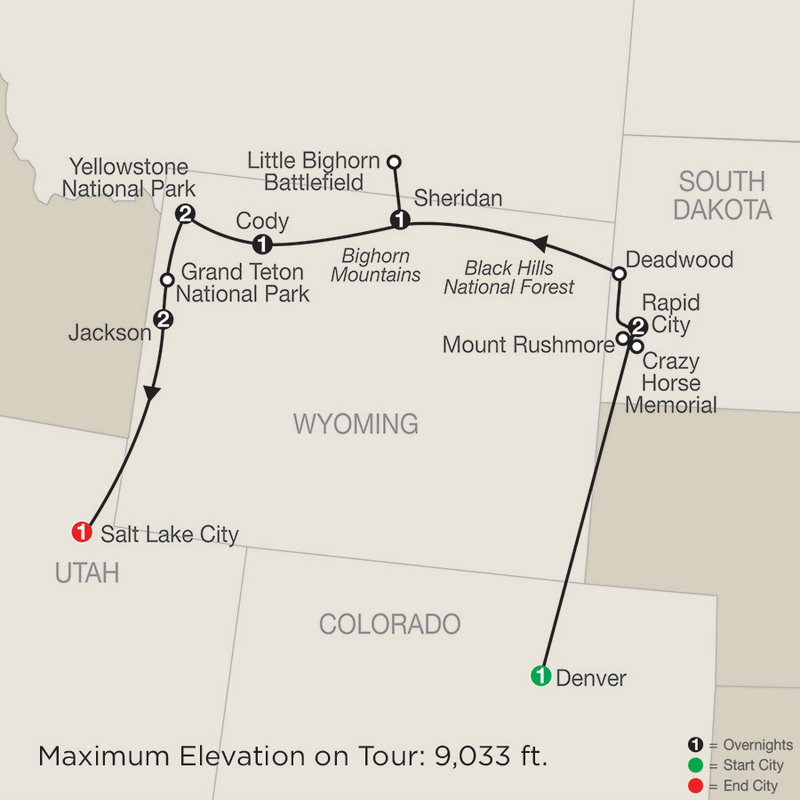 A tour ...Read More.